Play 18 is known to be Chicago’s most realistic golf simulator. Players are able to play over 50 of the world’s most prestigious golf courses, get in a quick round of 18 or just hit the driving range to work on your game. A must try if you are in the area and looking to escape the busy city life. If you are looking for more of a social scene then Fairways might be the spot for you. Play a round of 18 while also being able to choose from their 18 local beers on draught. Feel free to also grab a bite at the gastropub for a mid round energy boost. Fairways is an exceptional social zone to loosen up the swing and enjoy a first class social scene. If you find yourself in downtown Chicago and feel like playing a round of golf, My Chicago Golf is a top of the list choice to go for a virtual golf simulator. Anybody is able to go and play a round of 18 on one of their numerous courses that they offer. If you are trying to better your game partake in a private or group PGA lesson. You are also able to rent out the bar space with some friends and enjoy their BYOB policy. Halfway House Golf offers an affordable rate to play a round of 18 on any given day. Choose from over 90 different courses all over the world. If you looking to grab a bite players can order from the restaurant, HB Jones, where they will bring the food right to your bay. The East Bank Club is another perfect place to work on your ball flight and golf swing. They offer a driving range where the simulator is 90 feet away from you so you can track the beginning of your ball flight. Feel free to work on multiple aspects of your game by playing on one of their 15 championship courses on their high definition GC2 simulator. 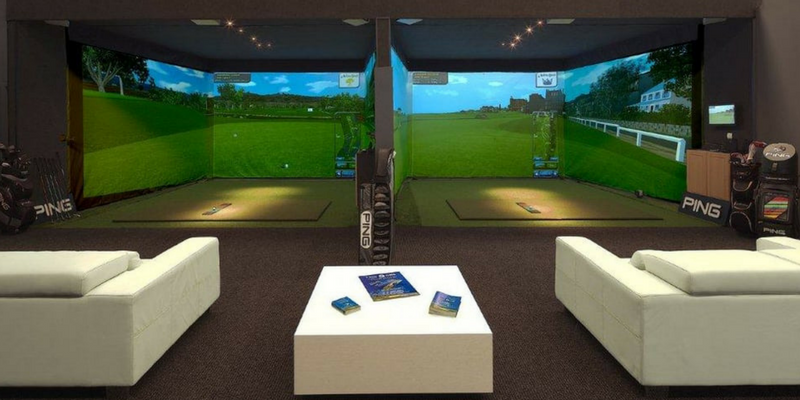 This is a highly rated indoor golf facility for those who wish to improve their game. Smart Golf and Fitness should be at the top of the list if you are trying to better your golf game. The instructors have excellent knowledge in fitness and golf mechanics. They will work on specific measurements on your swing and create an exercise program that will eliminate the limitations in your game. This is the perfect place to elevate your golf game and be at your highest level of competitiveness on the golf course.